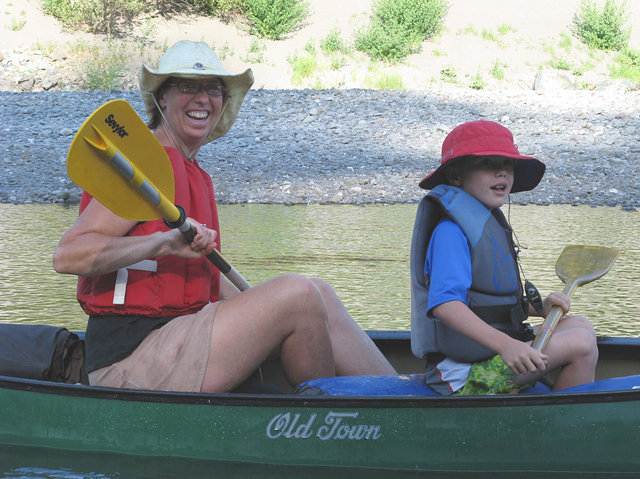 About six months ago, my friend Enid asked me to join her on a canoing trip on the Eel River. At the time I was preoccupied with getting ready for Scotland, and the Scotland trip was going to wipe out most of my paid time off, so I begged off. But, after coming home from Scotland, I decided a “local” trip (only a few hours drive away) to try canoing would be fun. I recalculated my time off and figured I’d have exactly the four days needed, so signed up for the trip. Now I could try canoing and compare it to my other waterborne experiences: kayaking, rafting and sailing. My previous group trips have been Sierra Club national trips and one commercial trip. This canoe trip was different, in that it is a private trip that’s been going for 14 or more years. Originally started by a local Sierra Club leader, Louisa, for her friends and family, it has become an annual tradition for many of the people on the trip. Four years ago, Evan took over leadership of the trip. Enid, who has also done Sierra Club national trips, observed that this trip was different because everyone knew at least one other person coming in to the trip, instead of being a group of strangers. I think she is right, that this made an important difference in the group’s cohesiveness during the trip. I think this will also carryover after the trip. I hope so. 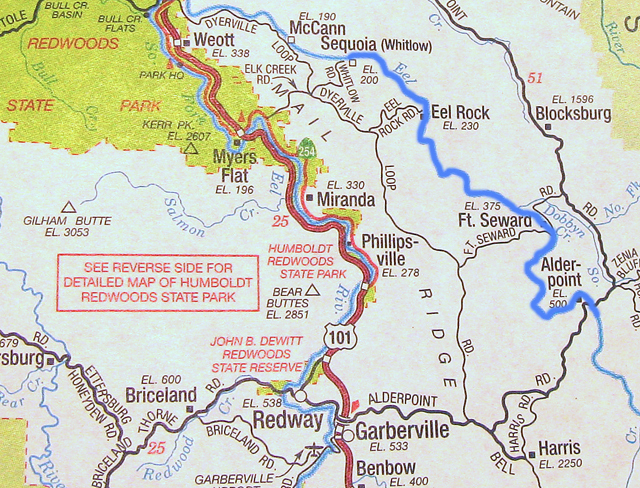 Our trip was on the main fork of the Eel River, between Alder Point and Sequoia (see map), with three camping locations. Our stay at Basin Creek included a layover day for exploring and the traditional rock climb and swim up Basin Creek to a waterfall. 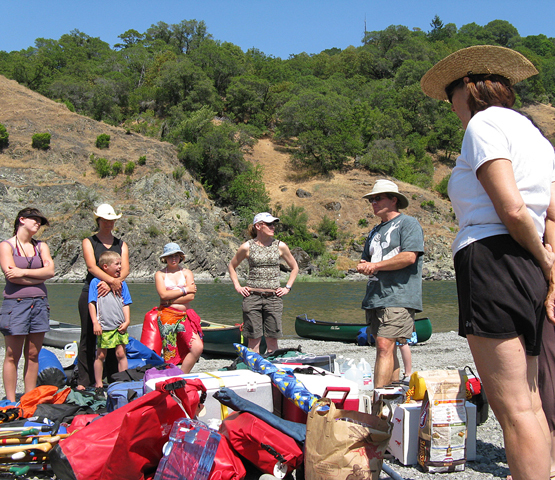 After meeting in Garberville and doing a car shuttle to have vehicles at our pullout at Sequoia, we headed east to Alder Point, where we unloaded boats, had some brief paddling instruction and headed off downriver. 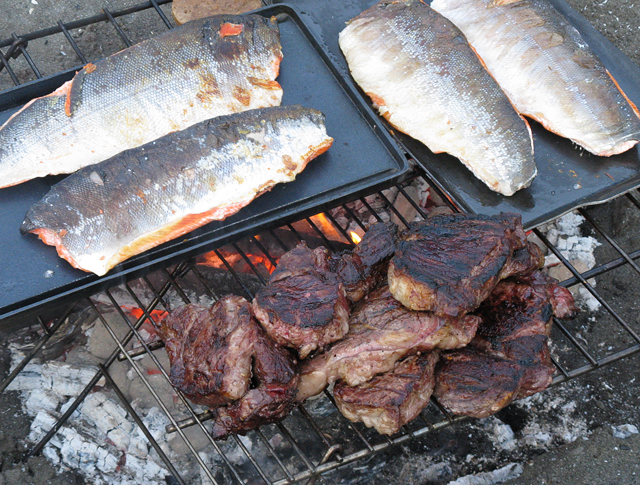 This was a short day, so after only a few hours we were at our campsite and set up for a typical, low-key dinner of grilled wild salmon and steak, green salad and cherries. It’s a tough life on the river.